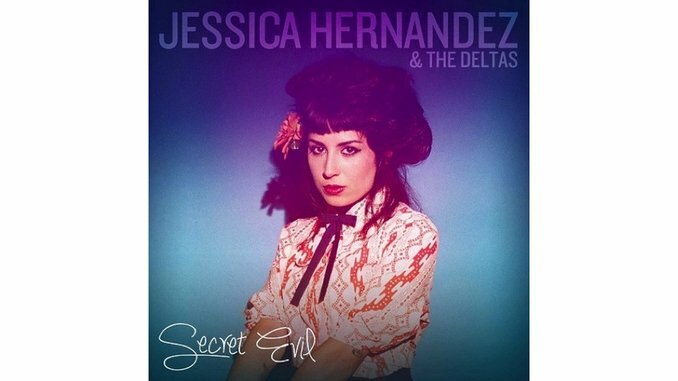 It might be said that the best way to experience Jessica Hernandez’ Secret Evil is as a listener who has never heard the striking, raven-haired songstress’ music before, as it’s almost certain to take those people completely by surprise. Her voice instantly captivates, radiating both power and sophistication on 11 tracks that vary wildly in tone. To those who have followed the Detroit native a little longer, the tonal shifts are a bit more understandable—there is some recycled content here, and a reworked song being given a glossy new coat of studio paint. Secret Evil is Hernandez’s full-length debut, and it catches her on the cusp of national consciousness while she appears to also be shedding a few influences and venturing into a slicker, more produced territory. Looking at her discography with a historical timeline in place, the evolution suddenly becomes more understandable—there are the older songs such as “Caught Up” and “Sorry I Stole Your Man,” which have both been recorded before, and new material that is opening new sonic doors. Clearly, the last year has been a transformative one for her. The compliment one can pay Hernandez is that she sounds equally comfortable in multiple sounds, and they’re both surprisingly effective. “Caught Up” is reproduced here exactly as it was on her 2013 Demons EP, which doesn’t add much value, but it’s still a thrilling neo-soul/rock number that shows Hernandez at her most direct and aggressive. “Sorry I Stole Your Man,” meanwhile, reveals Hernandez’ newer influences in its transformation from its previous recording on 2013’s Live at the Magic Bag. Gone are the wailing horns and driving R&B atmosphere, replaced with more restrained keys and lots of overdubbed vocals going “awooo.” It’s still catchy, but some of that live vitality and edginess is certainly lost in the translation. The rest of the album, those songs recorded exclusively for Secret Evil, is as a whole far stronger, revealing a burgeoning expansion of influences that draw heavily on modern indie pop and even electronic dance music at times in addition to the rootsier, dingier soul and R&B present on her earlier recordings. Songs like “Tired Oak” absolutely soar with a mix of pulsing percussion, keys and of course the triumphant vocals of Hernandez. Amy Winehouse is a persistent comparison, but she’s also reminiscent of an indie pop singer in the vein of April Smith & The Great Picture Show in her ability to vacillate between precious and vicious at the drop of a hat. It’s these tracks that have tagged Hernandez as an ascendant star, because songs such as “Dead Brains,” “No Place Left to Hide” and “Downtown Man” would be stand-out lead singles on just about any pop album, and likely smash hits for the likes of Katy Perry or Adele, in whose company the Detroit musician would not be misplaced, in terms of vocal ability. When she sings “Take my hand, I’ll show you the pheromone gland,” it’s clearly unnecessary—a new legion of fans will soon be willing to follow this young singer wherever she would lead. Her voice is more than enough of a lure—no chemical inducement is necessary.